REMEMBER THE DAYS? 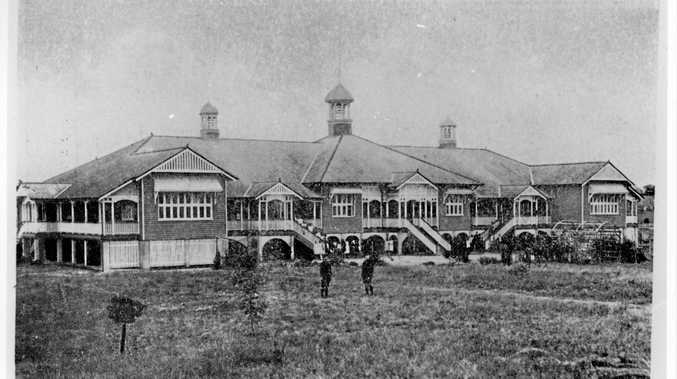 The original Gympie State High School building in Cootharaba Rd in 1917. 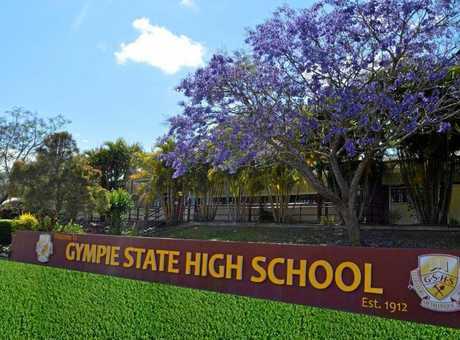 GYMPIE High School began life as the newly constructed Central State School Boys School in Lawrence St in late 1911. The school was converted into a co-ed high school and officially opened on January 29, 1912. One of six high schools in the state, the school had only four rooms and a vestibule with verandas out front and back. The front of Gympie State High School today. Although a co-ed school, a move that many found unseemly, boys and girls were kept segregated in the classroom and in the playground. Numbers for the school grew and by the following year, plans were being made for a new and bigger school and by 1916, with conditions cramped with 217 enrolments, a new building was started at Tozer Park in Cootharaba Rd. Just in time for the 50 year anniversary of Gympie, the new high school started classes on September 3, 1917, with the official opening in October. Four of the first Gympie High School female students won open scholarships to the University of Qld in 1922. One of these girls, Thelma Trott, who went onto achieve her honours degree was tragically murdered by her husband many years later. During the 1920s, non-compulsory school uniforms were introduced. The boys wore grey shirts, shorts and knee socks or trousers while the girls wore a navy pinafore or skirt over a white shirt and both wore maroon blazers with gold trim. Until buses to the outlying areas were introduced in the 1960s, a boarding house for girls was established at the Church of England Rectory at Mount Pleasant. The girls would board during the week and return at the weekend. Numbers dropped off at the school during the depression years and the attendances fell but by the 1940s numbers had climbed again. It was during the 1940s that Winston House in Channon Street started to board students. The Presbyterian Church bought 'Wyandra' which was built by Matthew Laird a mine manager for the Scottish Mine. This home later was owned by the Cullinane family who were a business people in Gympie from the early days. The church renamed it Winston House in honour of Winston Churchill. From 1946 to 1962 many country students stayed there. Also in the 1940s the P&C was established with Frank Sauer the first president. The committee raised a sum of £1050 for the development of the War Memorial Pavilion and the sporting oval, which at the time was one of the finest sports fields in Queensland. It was opened on August 27, 1949 and dismantled in 2010 to make way for the new science building. Two years later in 1951, the school became a comprehensive high school. This meant that it had an intermediate school, a junior teachers' training college and vocational classes for pupils from country schools. In the most dramatic chapter of the school's story to-date, the main building of the high school burnt down on the evening of May 18, 1955. Many of the school's records from the previous 40 years were lost. Trophies, honour board and photographs perished in the blaze. The fire, thought to have started in the chemistry storeroom from a carbon block that had been used in a lesson and returned to the storeroom but not properly extinguished, caused the school to close for only a single day. This was due to the efforts of the community, teachers and various organisations under the leadership of the principal, Harry Pegg, to restore normality as quickly as possible. The new school was built around the site of the old building and this became the parade ground. The rebuilding of the school continued over several years and in 1959, land was acquired on the other side of Cootharaba Rd for agricultural classes. The first tuckshop started on in 1958 by the P&C and was run on Mondays. The tuckshop was invaluable as a fundraiser and along with other activities such as dances, flower shows, street stalls and annual balls meant that the funds were there so improvements could be made to the school. Over many years the curriculum changed and grew in reference to the number of students and the requirements of the Education Department. In the 1950s, academic, industrial, domestic science and commercial courses were offered at the junior certificate level. Six subjects were then selected to follow through for the next two years to achieve a senior certificate. Agriculture was introduced in 1959, German language was offered in 1961 and art and physical education followed in 1962. The Hamilton Hall was opened on the March 18, 1972 and was the concept of the principal of the time, Toby Hamilton who encouraged the P&C to help raise funds from 1968. Enough money had been raised by 1969, so that a subsidy could be obtained from the government for the project. Other buildings that have been added over time including the administration block in 1958, the Commonwealth Science Block (J block) in 1968, H block in 1971 and the school library in 1972. A Special Needs Support Unit was established in 1990. Today the school continues to provide education and guidance to children in the Gympie region and offers a variety of opportunities and career pathways to our citizens of the future.